Ahhhhh, the four month sleep regression. Rare is the family that doesn’t experience some sort of disruption to their infant’s sleep patterns around the fourth month of life. Some experienced/well-read parents anxiously dread the impending “regression,” while most new moms and dads are completely blindsided by their little one’s sleep suddenly taking a nosedive around week 16. Let’s spend some time talking about why the regression occurs, what it looks like, and finally why I advise parents to sleep train no earlier than 16 weeks of age. First, you’ll find a lot of (sometimes pseudo) scientific explanations for why this regression occurs all over the internet and in sleep books, but I’m going to give you my professional and anecdotal explanation for the FMSR (four month sleep regression). From birth through to somewhere between the 9th and 15th week of life (counting from your baby’s estimated due date), babies’ melatonin output can be all over the map in terms of it being secreted on a regular and rhythmic basis from the brain. Melatonin is responsible for helping our bodies fall asleep easily, and regular intervals of melatonin secretion from the brain are important to establish a consistent nap schedule and nighttime sleep pattern. By week 15, babies have a regular output of melatonin, but the amount of melatonin excreted can still be minimal. By month 6 babies have developed a full regular rhythm of melatonin secretion from the brain. Now here is where the anecdotal part comes in. From birth through month four, babies often are simply unaware of the world around them. For most babies this lack of awareness is most pronounced in the first 6 weeks of life, with ever increasing awareness as baby grows older. It would seem that at around the same time melatonin production finally evens out (after month 3), awareness in children becomes so pronounced that all of a sudden they become very, very dependent on whatever it is they have needed up until that point to fall asleep. Since the majority of newborns are assisted to sleep in some manner (paci, rocking, swing, swaddle, feeding, etc), around month 4 they seem to suddenly need that assistance each time they complete a sleep cycle overnight, which would make sense since their sleep has suddenly become a lot more adult like, with regular outputs of melatonin throughout the day and night. I have found, again anecdotally, that a child’s innate temperament is what often determines exactly how “severe” the FMSR usually is. The more sensitive or strong willed a baby is, the more often they will demand that assistance to sleep throughout the night. The FMSR can present in a very, very wide variety of ways. Some parents barely realize it’s happening, and others note a marked change in their baby’s sleep habits. Some babies go from waking for feedings at 11 pm, 3 am, and 6 am (and falling asleep easily after each feed), to having the same wakings but noticing baby is simply unable to fall back to sleep as easily after each feeding. Many families notice that once their baby wakes after 4 am, they seem nearly impossible to put back to sleep. Other families find that their baby suddenly only takes short naps of 30 minutes or less throughout the day, while others note that it can take several “put downs” of rocking/feeding baby before baby finally stays down. The important thing to note is that any marked, seemingly permanent shift in your baby’s sleep habits around month four, regardless of its severity, is the FMSR. The GREAT news about your baby experiencing the dreaded FMSR is that you know your child has developed rhythmic excretions of melatonin which means they are finally ready to be sleep trained! Remember, the Baby Sleep Trainer definition of sleep training has almost everything to do with teaching baby how to go down flat on their back, eyes open, in a crib without any sleep props, and knowing how to put themselves to sleep from that point on 100% unassisted. Once that skill is developed, baby is then able to put themselves back to sleep overnight, eventually work through any early morning waking issues, and finally as they exceed month 6, babies are also usually able to have longer, restorative naps (babies younger than 6/7 months typically have short naps, regardless of whether they are sleep trained or not). 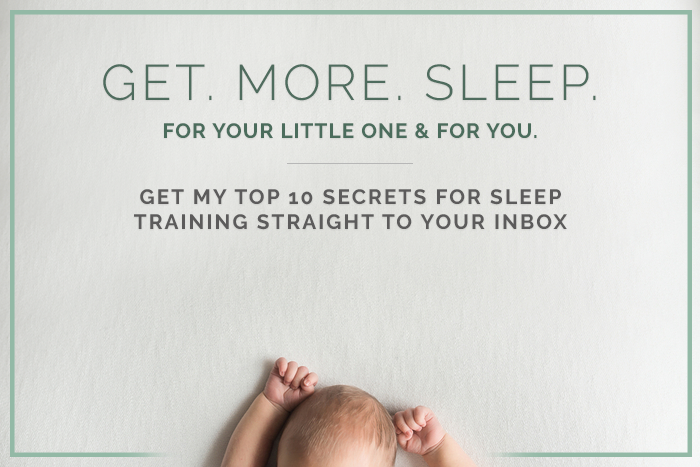 If you’re interested in combating the four month sleep regression by allowing your child to learn to fall asleep on their own, check out my affordable Online Training Series. I have developed the Baby Sleep Trainer method after spending over 15,000 hours working one on one with thousands of families around the world, and I’ve made sure to make hands-on help from me an affordable option for all families. The FMSR doesn’t have to be the start of poor sleep habits for your baby – it can be the beginning of lengthy night sleep, unassisted falling asleep for naps and bedtime, and a consistent and regular daytime schedule.